Saint Stephen was chosen after the Ascension to be one of the seven deacons who would look after and distribute alms to the poor. He was "full of grace and fortitude, and was working great wonders and signs among the people." He was accused of blasphemy against Moses and God, and the Sanhedrin condemned him to be cast out of the city and stoned to death. Kneeling down he cried out in a loud voice, "Lord, do not lay this sin against them." One of the onlookers at his stoning, perfectly approving the sentence, and in fact minding the clothes of those who took part in the stoning, was a certain Saul of Tarsus - later to be converted to Christianity on the road to Damascus, and become the venerated Saint Paul. 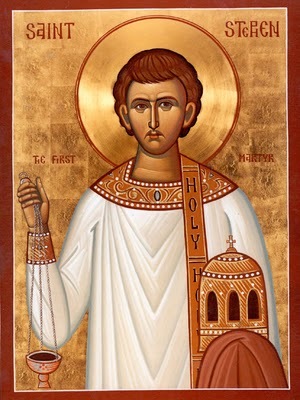 Saint Stephen was stoned to death in the year 35AD.